Nine in 10 doctors, nurses and other front-line staff at St Helens and Knowsley Hospitals have had the flu jab, Public Health England figures reveal. By the end of December 2018, 90% of front-line workers at the trust were vaccinated - the highest uptake in England. 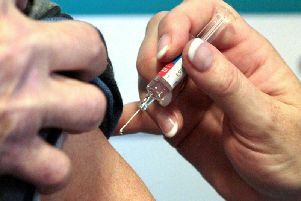 NHS England is aiming for "near universal" coverage of the flu vaccine this winter among staff. Of the 3,637 doctors, nurses, clinical staff and support workers at the trust with direct patient contact, 3,275 were vaccinated between September and December. That's far higher than the national average of 66%, but 362 healthcare workers remain unvaccinated. NHS bosses have now warned that staff refusing the vaccine could be banned from treating patients. St Helens and Knowsley Hospital Services NHS Trust reported that 139 staff turned down the jab - making up almost 40% of unvaccinated staff. Coverage at the trust has improved since the same period in 2017-18, when 85% of front-line staff were vaccinated. This winter's uptake has varied considerably between trusts, with Oxleas Trust in south east London and the Birmingham and Solihull Mental Health Trust both reporting a vaccination rate of just 35%.